Calculate the significant tornado parameter (fixed layer). The lcl height is set to zero when the lcl is above 2000m and capped at 1 when below 1000m, and the shr6 term is set to 0 when shr6 is below 12.5 m/s and maxed out at 1.5 when shr6 exceeds 30 m/s. © Copyright 2017, MetPy Developers. Last updated on Jan 06, 2019 at 02:33:59. 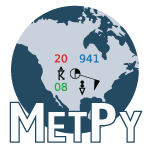 Do you enjoy using MetPy? Say Thanks!